> HighJump Software > ERP vs. WMS: What's Your Best Option? The question for today’s supply chain professional isn’t whether your ERP offers warehouse management functionality. The question is whether you’ll actually be able to achieve efficient order fulfillment operations when using it. There are critical differences between the warehouse management functionality contained as a component of an ERP system and the functionality of a stand-alone, best-of-breed WMS. 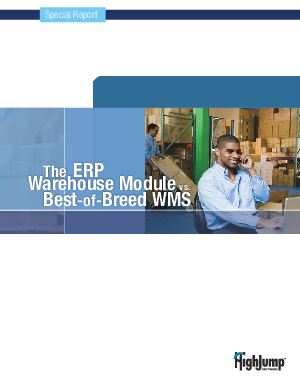 In the report, “The ERP Warehouse Module vs. Best-of-Breed WMS,” you will learn the critical decision factors every warehouse, logistics, IT and supply chain professional must consider when comparing these two very different options for optimal warehouse management efficiency. After reviewing each of the factors, you will be able to make a well-informed decision about the type of software solution that is best suited for your specific business. Follow the link below to access this valuable report.